One of the most stunning examples of lofty valuations with reminiscences of the tulip mania is Bitcoin. Below is the Bitcoin chart of the last 5 years. Bitcoin made an incredible run and went from 5 cent to over $1000 in a little more than three years. 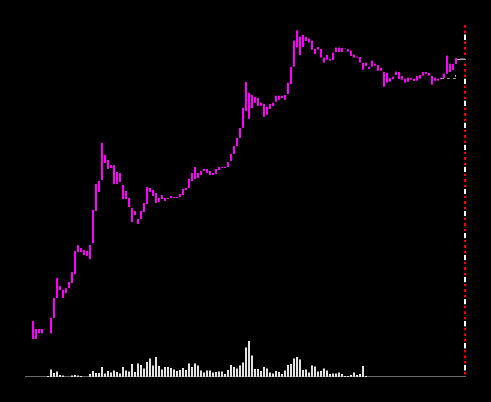 Every white dot of the vertical scale marks a doubling in price! This type of run lets even penny stock explosions look lame. But that’s not all. Bitcoin’s current market value is about $7 billion. Quite a fat penny stock. So, will Bitcoin be able to break the highs from 2013 and how far can it go afterwards? As usual, no one knows, and a Zen Trader doesn’t need to know. All we need to know is that there is potential. And in the case of Bitcoin there is, because it has no real intrinsic value. It is disconnected from fundamental valuations. Such a situation is the launch pad for crazy price runs. Are the hopes of the Bitcoin community for Bitcoin becoming a real currency justified? Probably not. But that doesn’t stop Bitcoin to do its next run, because there is a big difference to tulips. For investors it is the volatile market that they waited for so long. For pirates is is the chance to fight the governments and authorities. And for computer visionaries is is the next hacking eldorado. Bitcoin is a digital dream. Don’t underestimate the latter two forces. It is not only the traders that power Bitcoin! You can even trade Bitcoin leveraged.